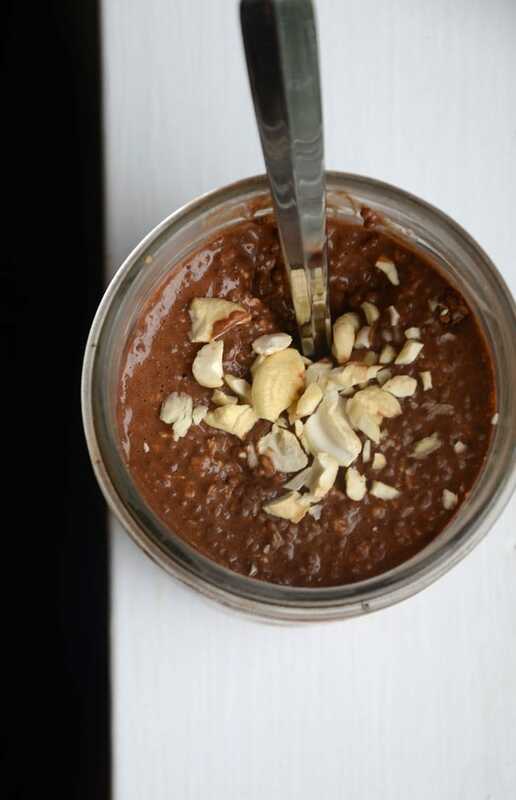 This chocolate chia seed oatmeal is pretty much all my favourite things packed into one convenient, chocolatey, delicious, nutritious breakfast. It’s soooooo YUMMY! I make chia seed oatmeal a lot, usually letting it set overnight so I can just grab n’ go in the morning. With early morning workouts, I don’t eat breakfast until I get to work, so this makes the perfect portable solution. Plus, you get to eat chocolate for breakfast! I think cashew butter might be my favourite of nut butters. Sweet, creamy, decadent…mmmm….cashewww butterrrrr. As if cashews could even get any more delicious?! As for chia seeds, I eat them almost everyday, they’re so packed full of nutrition and make a great addition to a plant-based diet. 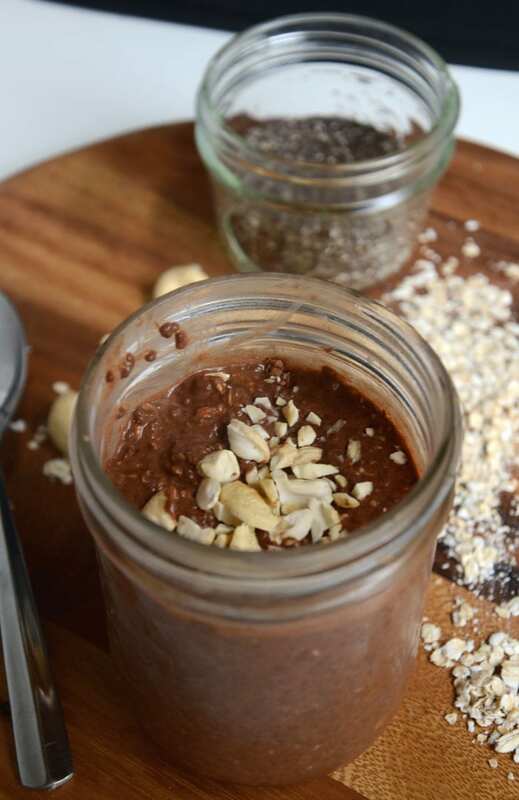 In addition to tasting like chocolate pudding, this chocolate chis seed oatmeal is brimming with antioxidants, energizing carbohydrates, protein and healthy fats, everything you need to power you long into the morning. And might I say again, chocolate. For breakfast. You can really make this with any nut butter or even tahini and it would be delicious. Add all ingredients to a container and shake or stir vigorously. Set in the fridge for at least 20 minutes, up to overnight. Alternatively, it can be cooked stovetop until thick and creamy, about 5 minutes. 1. 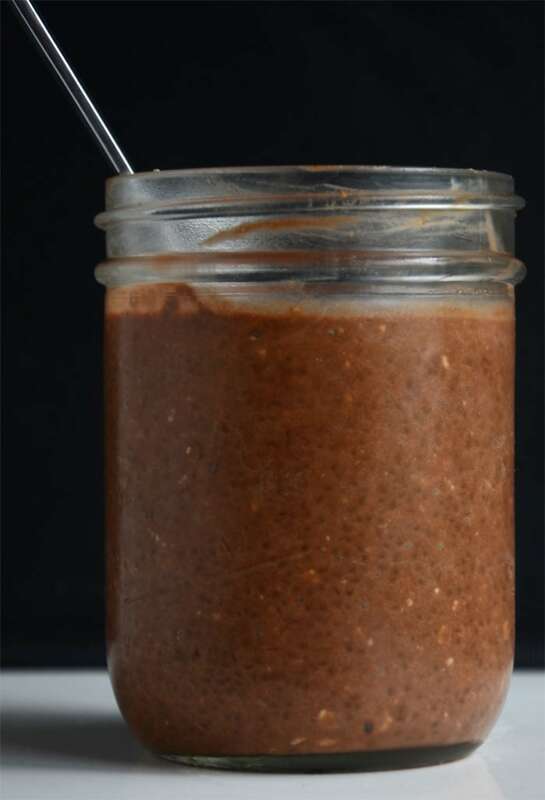 If you want to increase the protein in this recipe, replace 2 tbsp of the cocoa with 2 tbsp of vegan chocolate protein powder, such as Vega Performance Protein and reduce or omit the maple syrup. 2. If you plan on letting this sit overnight, you may want to add a little extra milk as it will be very thick. Try adding an extra 1/4 cup of almond milk. 3. If you’re eating at home or want to bring the cashew butter on the side, I’d recommend swirling the cashew butter in at the end, after it’s set. 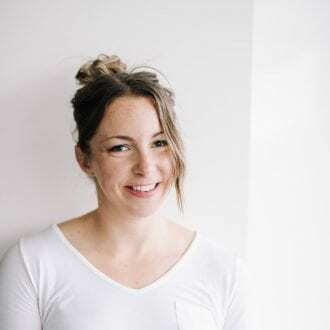 You’ll get more flavour and bites of the yummy cashew butter that way! I’ve never tried cashew butter before but I’m sure I’m missing out! This looks delicious! I’m such a big chocolate fan! I just made pb2/carob chia overnight oats for tomorrow so we are on the same wavelength. I love the chia seeds because they make the texture a lot smoother. Cashew butter is the only nut butter I haven’t tried and I’m dying to. Now I have my next overnight oats recipe! Hundred per cent making this for breakfast soon! That looks yummy – I have never tried cashew butter, but I have seen it in my local Health Food shop, you have inspired me to try it. I love cashew butter but I never thought to mix it with chocolate! Mmmm … caaashhhewww bbuuuutttter!!! Love it!! Overnight oats are a fave, but I haven’t tried with chia seeds! Guess what I’m making?? 🙂 Pinning quick-quick to share!! Hah, I eat chocolate for breakfast quite a lot… haven’t seen a chia pudding fused with overnight oats before, will have to give this one a shot! 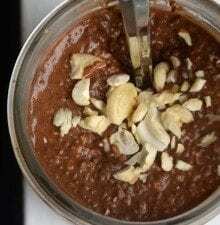 Its great to see mix with chocolate and healthly chia seeds. It looks brilliant. Can I omit the oats and the recipe still turn out? Thanks! this seems so delicious! -can I ask for the ingredients ?